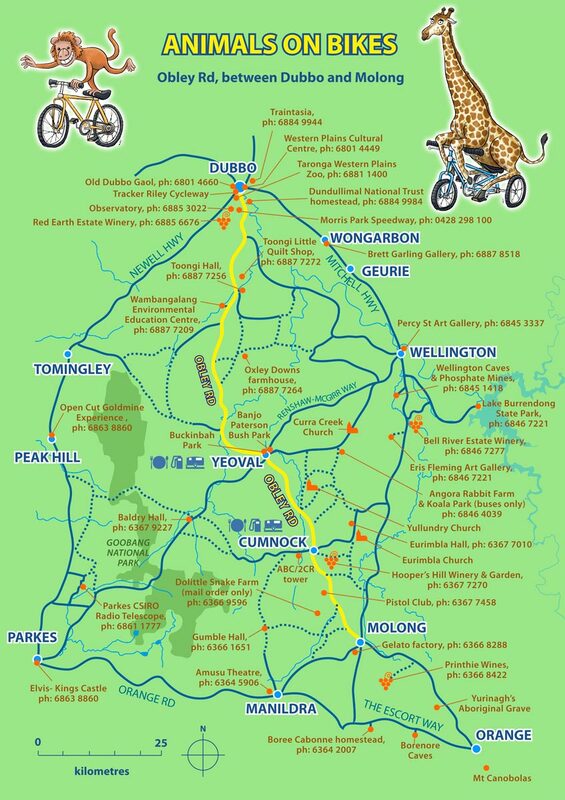 Here is a Tourist Map that shows you the 120km route that 'Animals on Bikes' sculpture trail takes along the scenic Banjo Paterson Way to the Taronga Western Plains Zoo. The map also shows neighbouring tourist attractions across 6 Council areas between Orange, Parkes, Dubbo, Wellington, Cabonne and Narromine. You can download and print a Colour version or Black and White Tourist map (1 page) here before you travel. Wrapping paper/Maps are also available along the route for $2 each. For more detailed information, please download and/or print the 2013 versions of the Tourist Map 2 page or 12 page option.